The Monroe County Parks Advisory Committee met on Thursday, February 16, 2017 at 6:00 pm to review, discuss and receive public comment on the Draft Highland Park South Master Plan Update. The plan will guide future improvements to Highland Park South. The meeting was held at Olmsted Lodge in Highland Park, 171 Reservoir Avenue, Rochester, NY 14620 (across the street from the Lamberton Conservatory). The Lilac Arches and Lamberton Conservatory are available for wedding ceremonies, receptions, and pictures reservations. The Sunken Garden is also available for rental, but limited to pictures only. Please click here to access our Online Lodge & Shelter Reservation System. The Administrative Park Office is located at 171 Reservoir Avenue, Rochester, NY 14620. The ice skating rink is located at Lily Pond, on South Avenue near School #12. There are no skate rentals; you must bring your own. For rink conditions call 585 753-PARK (7275) during the week between 8:30am and 4:30pm, or 585-753-7270 on weekends between 10am and 4pm. ​Groomed natural-ice surfaces are in Churchville, Ellison, and Highland Parks. There is a warming hut available nearby the rink at Highland Park. Skating is done at your own risk. Highland Park has a carry in-carry out rule, which means you must take all your garbage with you for disposal after leaving the park. All pets must be leashed and you are responsible for cleaning up after them. The only lodge available for rent in Highland Park is the Olmsted Lodge (seen in photos below). The Lilac Arches and Lamberton Conservatory are also available for wedding ceremonies, receptions, and pictures reservations. The Sunken Garden is available for rental, but limited to pictures only. Please click here to access our Online Lodge & Shelter Reservation System, or call 585 753-PARK (7275). Designed by Frederick Law Olmsted to seem like a natural occurrence of trees, shrubs and flowers, Highland Park is actually a completely planned—and planted—arboretum or “tree garden.” In addition to over 1200 lilac shrubs, the park boasts a Japanese Maple collection, 35 varieties of sweet-smelling magnolias, a barberry collection, a rock garden with dwarf evergreens, 700 varieties of rhododendron, azaleas, mountain laurel and andromeda, horse chestnuts, spring bulbs and wildflowers and a large number of trees. The park’s pansy bed features 10,000 plants, designed into an oval floral “carpet” with a new pattern each year. Conservatory Admission: Youth (0-5) Free, Adult (19-61) $3.00, Youth (6-18) / Seniors (62 and up) $2.00. The Conservatory is open 7 days a week, 10:00 a.m. until 4:00 p.m. except Christmas Day. Call 585 753-7270 for more information. Seasonal Passes are available year round. Individual passes are $10, Family passes are $30 and Company/Institutional passes are $50. Located near the corner of Highland and South Avenues, the Lilac Arches features interesting architectural form, a brick patio and benches. This site is available for rent for small receptions and weddings. For information and reservations please call 585 753-PARK (7275) or go to our Online Weddings Reservation System. 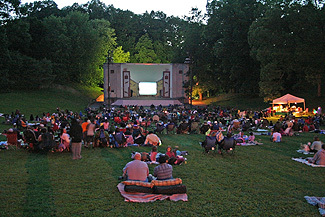 An outdoor amphitheater used for summertime concerts, Shakespeare in the Park and FREE Movies in the Parks series. 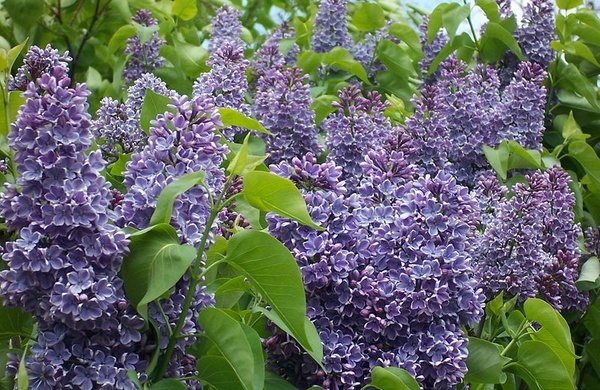 The 2019 Lilac Festival will take place from Friday, May 10th until Sunday, May 19th. A memorial that allows people who have been affected by the AIDS virus a quiet place for reflection. A memorial that recognizes members of our community that have advanced the mission of the AFL-CIO. 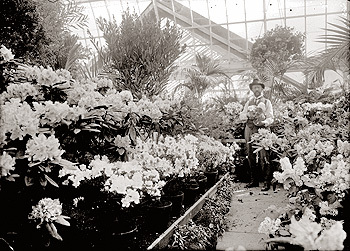 Originally constructed in 1911, the Lamberton Conservatory was named in honor of Alexander B. Lamberton who was the President of the Parks Board from 1902 to 1915. Original funding from the relatives of Lamberton provided for the building costs and would allow for continuous specialized exhibits of diverse plant species. Already a nationally renowned arboretum designed by Frederic Law Olmsted, Highland Park’s horticultural status was certainly heightened by its construction. Special events and exhibitions of far off floral wonders continued to delight generations of Rochesterians. The structure would expand over time and its interiors would become known as a tranquil destination or even a tropical respite to Rochester’s chilly winters. By 2006, the original building had deteriorated to the point that it was not cost effective to maintain and like most historic structures of that period, time had just gotten the better of it. But in 2007, the Monroe County Parks Department sought the one million dollars it needed to do a complete tear down and historic reconstruction, maintaining every possible detail of the original design. This newly restored section of the Conservatory has approximately 1,800 square feet of floor area and boasts nearly 1,000 brand new panes of glass specially formed for structures of this type. The full restoration had become a reality because high temperatures and humidity, required for the tropical displays, had taken quite a toll on the steel as well as the glass that was more than 80% original. The original Conservatory was then dis-assembled right down to its foundation and reconstructed with modern materials, as an exact replica of the historic structure. The existing steel framework was removed and used as a pattern for the new galvanized steel framing system. The original interior cypress gutter system was salvaged, refurbished and reused as were the operable ridge-vent, the exterior cast iron gutter system, and the memorial to Alexander B. Lamberton that is, once again, mounted over the front doors. The reconstruction effort was jointly managed by the Monroe County Department of Parks and the Monroe County Department of Environmental Services. With their strict attention to detail, the Conservatory’s reconstruction is a testament to Monroe County’s dedication to our history and our continued commitment to our community’s wonderful quality of life. The Sunken Garden on the grounds of historic Warner Castle in Highland Park is one of Rochester’s landscape architectural treasures. The garden was designed by noted Landscape Architect Alling Stephen DeForest, 1875-1957. Warner Castle was designed by Horatio Gates Warner and built as his private residence in 1854. In 1912, Frank and Merry Ackerman Dennis, owners of the Dennis Candy Factory and candy stores purchased it. They commissioned DeForest to design gardens for the site beginning around 1920. His plan for the grounds included the Sunken Garden completed in 1930, a courtyard, rose and woodland gardens. Alling Stephen DeForest, a Fellow of the American Society of Landscape Architects, contributed to a wide variety of landscape designs, both public and private, during the early 20th Century. He received most of his early training at the prestigious Olmsted Brothers firm in Brookline, Massachusetts. Frederick Law Olmsted, considered the father of landscape architecture in America, was the founder of the firm. DeForest’s most notable projects were the original landscape of the George Eastman House on East Avenue in Rochester and the gardens of the Harbel Manor, the Akron, Ohio home of Harvey Firestone. Although the majority of his designs were the landscapes of private estates, he also designed campuses, housing developments, cemeteries and parks. Frank Dennis died in 1927 and Merry Dennis continued to live in the castle until her death in 1936. Dennis’ relatives contested her will and the estate was not settled until eight years after her death. The castle became a sanitarium in 1944 when it was purchased from the estate by Christopher Gainers a self-styled naturopath. 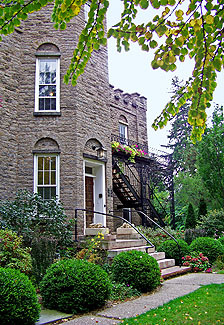 The City of Rochester bought the property in 1951 and the castle and grounds became part of Highland Park, an internationally known arboretum. The City’s Parks Department’s offices and herbarium were located in the castle and the Sunken Garden became a popular location for weddings and wedding photographers. The Rochester Civic Garden Center’s headquarters now occupy the building. In 1961 an agreement between the City of Rochester and the County of Monroe turned the responsibility of the maintenance of the castle grounds and Rochester’s major parks over to the Monroe County Parks Department. Time, weather and vandalism took their toll of the garden’s infrastructure and in 1988 the garden was closed to the public because of the Monroe County Parks Department’s concern for visitors’ safety. A year-long study of the site, funded by the Institute for Museum Services, was undertaken by Doell and Doell, Historic Landscape Preservation Planners and Environmental Design and Research, P.C. of Syracuse, NY. Restoration of the Sunken Garden’s infrastructure was completed in October 1991, with funds from Monroe County and an Environmental Quality Bond Act Grant. The garden’s stone walls were repointed and missing stones replaced. Paving stones, an important landscape design element included in DeForest’s design for the garden were also replaced. The historically appropriate plant material was replaced through the cooperative efforts of The Landmark Society of Western New York, the Seventh District of the Federated Garden Clubs, and the Genesee Finger Lakes Nursery and Landscape Association in 1993. The plant material restoration project received the New York State Preservation League’s Historic Landscape Preservation Award in 1995 and illustrates what can be accomplished through the cooperative efforts of the public and private sector. The Warner Castle Sunken Garden, a significant part of the landscape heritage of Rochester, New York, provides residents and visitors alike with the opportunity to view a planned landscape designed by a noted landscape architect. Classes: RCGC offers over 200 classes a year to the community, including certificate programs in basic gardening, landscape design, plant propagation, plant identification, pruning, and floral design, and a variety of individual gardening, horticulture, and floral design classes. Special Events: RCGC offers several special events to the community every year, including a Spring Symposium featuring nationally and internationally renowned gardening experts, a spring plant sale with many local specialty vendors, a summer garden tour allowing access to some of the best private gardens in our area, and a master class lecture series with local and northeast-regional gardening experts. Horticultural Library: The RCGC Library contains over 4,500 volumes, the largest collection in our area devoted exclusively to all aspects of horticulture and gardening. As well as books, the library contains current and back issues of many magazines, and garden catalogs, photographs and prints of garden subjects. The library is open to the public for reading and reference. RCGC members have book-borrowing privileges, and a "Library-Only" membership is available for a $5 annual fee. You can search our catalog online and reserve books on our website. Hours: Tuesdays, Wednesdays & Thursdays, 9:00 am – 4:00 pm. There are occasional Saturday hours from 9:30 am to 12:30 pm. Please call us to inquire about Saturday open hours. Membership: Members receive discounts on classes and events. Visit their website website for more information on the Rochester Civic Garden Center and our programs and library.